Tomorrow morning (yes April Fools Day) I'm going under the knife. The reason? Tonsils the size of golf balls. In other words, this diagram isn't "to scale" when it comes to me. They've always been huge...but tomorrow they come out. And, from what they tell me, I'm going to be laid up for at least ten days. So, the way I see it, I have two options. I could offer you guys riveting information about my applesauce, cottage cheese, Jello and ice cream diet. Or, I can hand over the reins of this juggernaut to the love of my life, the future Mrs. LENNDEVOURS. I've decided to spare you the pain of reading swallow-by-painful-swallow accounts of my vertical tasting of instant pudding flavors. Nena's just a touch nervous about taking over...so please welcome her as she makes a few posts in the coming week. I'm sure I'll not be able to leave my laptop alone for the next ten days...so I'm sure I'll be around...but only in an unofficial capacity. How I'll survive without drinking wine for the next couple of weeks remains to be seen. That may be the most painful part of this whole situation. Well all know how "hot" Pinot Noir is right now, mostly because of the movie Sideways. It seems like every time I visit my favorite wine shops, there are more Pinots on the shelves from a variety of regions. My favorites usually come from Oregon and, of course, Burgundy. This particular Pinot, I specifically sought out based on a recommendation from Jim Waters, winemaker and owner of Waters Crest Winery. He admitted one time, as we sipped his stellar Riesling, that he doesn't typically like Pinot Noir...but that this one is a definite exception. So, I drove to Stew Leonard's in Farmingdale, NY specifically for this wine. Of course, I ended up with a few other bottles too. I can count on one hand the number of varietal Grenache wines I've tasted. And frankly, I don't remember much about them at all...which probably tells you all you need to know. 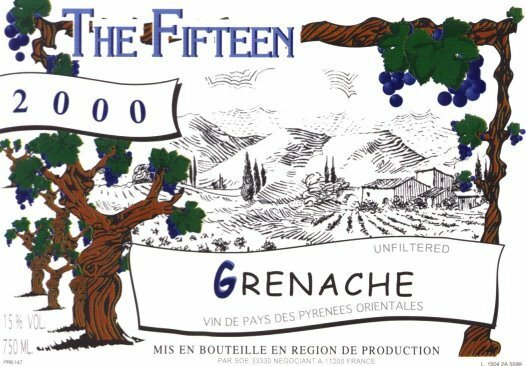 Last week, when I was doing some pre-Easter wine shopping, I saw The Fifteen 2000 Grenach with a nice little note on the shelf touting it's score from Parker (a 90). I figured for $14 bucks, I'd give it a shot. I wasn't able to dig up a ton of information on this wine, but it's made in the Mediterranean city of Rousiilon in the south of France from low-yielding (two tons per acre) old Grenache vines. We opened upstate at my future in-laws house Saturday afternoon as FMIL (future mother-in-law) prepared a delicious pre-Easter dinner for the family (more on that later this week). Eyes: It's a deep, dark purple color and extremely dense in the glass. It almost looks thick. I don't usually note the "legs" but this wine had long, thick legs that lingered. I guess that's what 15% alcohol will do for you. Nose: Obviously Old World on the nose. Filled with earthy aromas like mushrooms, wet soil with hints of black pepper. I got very little fruit at all until it had been in my glass for 45 minutes or so. Even then, the black cherry flavors were quite subdued. Tongue: Not the most complex wine in the world, but nicely restrained and rich. The earthiness and spiciness of the nose are quite concentrated on the palate, with the pepper and spice really showing on the long finish. For 15% alcohol...this wine isn't "hot" at all. Nicely integrated and structured. Overall: This is a nice, interesting wine that was a nice diversion for us. I would most definitely buy it drink it again. I think it would be great to put this wine into a blind red wine tasting for my friends...because it's just so different from the reds they usually drink. Another Reason Not to Put Too Much Faith In What the International Wine Media Says? Howard Goldberg, a fairly well known American wine writer does a weekly column in the New York Times on Long Island wines, not-so-creatively titled Long Island Vines. As a Long Island wine lover, I read it every Sunday. Sometimes I really enjoy it. He has better connections than I do (at this point) and usually hears about stuff long before I do. Sometimes though...I'm disappointed. This week's column is one of the disappointing ones (not because of Howard though). And, I think it illustrates why the job of "International wine god" is so difficult...and why we shouldn't always assume the "experts" are right. In the piece, Howard notes that Hugh Johnson and Oz Clarke have mentioned Long Island wineries in their annual buying guides, which is great. 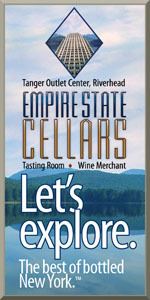 There is even a small mention in Karen McNeil's Wine Bible about our region as well. But it's obvious to me, someone who is intimately familiar with the region and the wines, that they either haven't been here recently, didn't do a comprehensive tasting of the wines, or (and I hope this isn't true) fell victim to Long Island's wine marketing machines. Bordeaux. It’s the region most often used to describe our unique climate. It should come as no surprise then that many Long Island winemakers focus mainly on Merlot, one of the most important grapes in Bordeaux. Channing Daughters Winery in Bridgehampton is delightfully different. Do they make Merlot? Sure. In fact, they make a few different ones, depending on the growing season, each with its own distinctive character. But, Merlot is certainly not winemaker Christopher Tracy’s focus. And Bordeaux isn’t the only region he thinks of either. 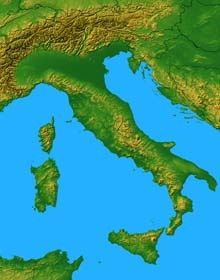 Instead, he looks east to the Friuli region in Italy. “Like Friuli, we are a maritime, cool-climate wine-grape growing region. This is an excellent opportunity for white grapes to achieve optimum ripeness, flavor and acidity levels year in and year out. The soil and the landscape of the Isonzo region in Friuli especially bears these resemblances,” Tracy said. Don’t believe him? Stroll through their fields and you’ll see Tocai Friulano, Pinot Grigio and Pinot Bianco. 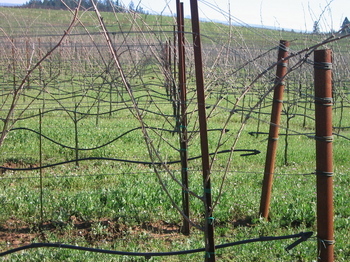 Aside from these unique-to-Long Island varietals, they also grow ligoté, malvasia bianca, and muscat ottonel. Waiter...There's a Crystal in My Wine! I got an email last night from a reader that I thought would be to share. After all, as LENNDEVOURS evolves...I'm hoping to add more educational content. "Lenn, I just had a bottle of Castello De Broghese's 2004 Novello. Delicious and paired well with a leg of lamb I had. Anyhow, in the last glass, I noticed there were crystals of I what am hoping sugar on the bottom. Is this common with this wine? It has to be sugar crystals, because when I washed them with water, they retained their color, I got scared for a moment that ground glass found its way into my bottle." Don't worry my wine-loving friend. These crystals are not ground glass...and they aren't even sugar either. Keep washing them with water and you'll notice that they don't dissolve. Sugar would. What are they then? They are potassium-bitartrate crystals. And they aren't a flaw in the wine at all. They don't affect the flavor or color in the least...and they won't hurt you either. Weak Winter Tomatoes -- Why Even Bother? If you're a restaurant and the tomatoes at your disposal are pink, lifeless, hard and taste like cardboard...why do you put them in your salads? WHY!?!?!?! I demand an answer! Are there people who actually enjoy these things? 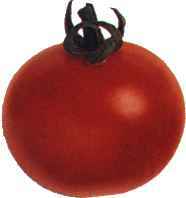 Are wedges of tomato such a mandated ingredient that must appear in any salad, regardless of season and geographic location? I know. Not every restaurant can afford or gain access to locally grown tomatoes year round. I'm not a complete food snob and I really do understand that. But, if you can't get a decent tomato, please don't serve it to me. It's the strangest things. No restaurant (at least not the ones worth going to) will knowingly serve brown lettuce or rotten steak...but these corrugated-tasting tomatoes make it through for half the year. Stop the madness. If you want some non-green color in a salad, use a radish or some roasted red peppers. Maybe a dried cranberry or something. Just stop serving me tomatoes that would be more useful on a baseball diamond. Sorry to rant...but the only thing annoying me more than this lately is the magazine subscription inserts...in magazines I already subscribe to. You know who you are. I can't help it. I have a sweet tooth...even if I'm not big into eating dessert (at least not compared to the future Mrs. LENNDEVOURS)..I love dessert...dessert wine that is. Macari Vineyards' Block E, a dessert wine made in an ice wine style, is one of my two or three favorite Long Island dessert wines. I picked up a bottle of their newly-released 2003 Block E a few weeks ago, and I have to say, it's been torture not popping it open and polishing it off myself (mabye letting Nena have some). But, I was able to control myself...until our wine tasting party Saturday night. After an evening tasting seven reds of various vintage, varietal and region and enjoying a dinner of grilled steak with scallion mashed potatoes and green beans with applewood smoked bacon and caramelized onions, I just couldn't help myself. I had to open the Block E.
FERMENTATIONS, always an interesting read, recently annouced the Wine Blog Masti Awards, a list of awards focusing on wine blog mastheads. I'm proud that LENNDEVOURS won for the Best Use of Whimsical Type. Ironically enough, I'm planning a redesign of LENNDEVOURS in the coming months. Even if the current logo (which I did myself with my rudimentary skills) has gotten me this far, I have an actual designer working up a real logo for me. It should come as no surprise that April's Wine Blogging Wednesday host, Ron of LoveSicily, is sticking with...well, Sicily for his them. Sicilian reds to be exact. WBW #8 is April 13th...so start scouring store shelves for a Sicilian Red. I'm sure we'll get lots of Nero D'avola...which is actually a varietal I enjoy a lot. But, I'm guessing that a few people will come up with some non-Nero reds. As someone with partial Sicilian roots (25%)...this seems like a good excuse to learn more about vino in my homeland. Michael Lynne, owner of Bedell Cellars in Cutchogue and Corey Creek Vineyards in Southold, wants to be the best. 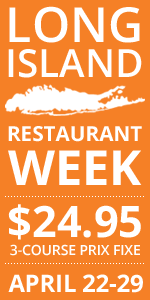 But not just the best on the North Fork or even in the U.S. He wants to be the best in the world. In early February, this commitment to making world-class wines led Lynne, whose “day job” is running New Line Cinema as co-Chairman and co-CEO, to hire Pascal Marty, formerly of Chateau Mouton Rothschild, as his consulting oenologist, and John Irving Levenberg, most recently at Paul Hobbs Winery in Napa Valley, as associate winemaker. They join founding winemaker “Mr. 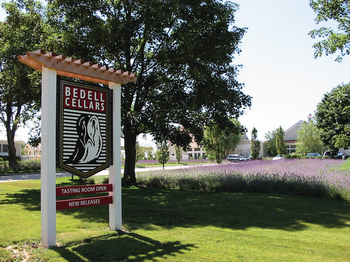 Merlot,” Kip Bedell, to create a formidable winemaking team. 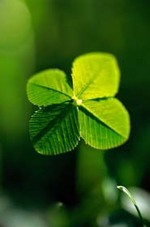 Though I'm only 25% Scotch-Irish by heritage...St. Patrick's Day remains a favorite holiday. Shepard's pie, corned beef and cabbage....Guiness! What's not to love?!? This year, Nena and I won't be hitting any Irish pubs or the like. Instead, we're heading to our friend Lisa's parent's house for a menu meeting...because we're catering her engagement party. I do know, however, that her mother picked up six pounds of corned beef...and I'm sure cabbage is on the menu as well. I'll just have to get the Guiness on the way there. So raise a glass...and enjoy your evening. Just make it to work tomorrow morning if at all possible. Carolyn of The Ultimate CA Wine Blog sent me a link to her latest project (well, this is the 2nd year for it, but you know what I mean) -- a blog that gives you a vines-eye view of the vineyard life cycle. Check it out. Should be fun to watch. 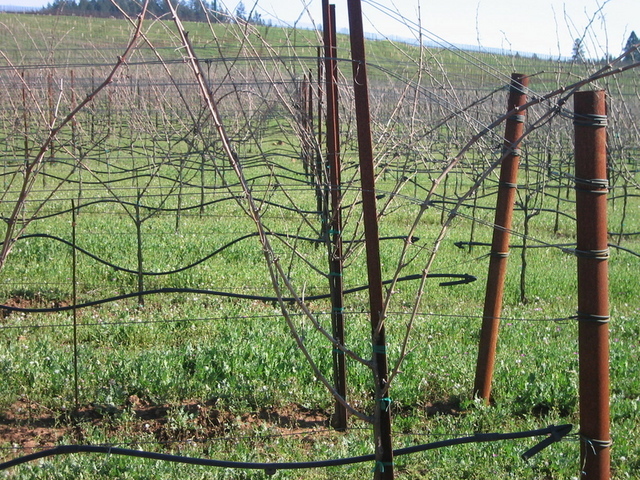 After all, a lot of winemakers say you really grown wine...not make it. I'll have to do a comparison picture the next time I'm out at a Long Island vineyard. Let's just say ours are still covered with snow at present time. Yes, you could say our growing season is a lot shorter. Tom over at Fermentations has started an interesting discussion on different rating systems. If you check out his post, you'll see that I wrote a pretty lengthy comment about it. Also, he points to Swirl & Sniff (whose rating system started him thinking)...it's a nice site...check it out. LENNDEVOURS 2nd Wine Tasting -- One You Like. One You Might. We started by tasting over a dozen Long Island Pink Wines...but, much to my (pleasant) surprise, members of the LENNDEVOURS tasting panel demanded some red wines the next time around! Who am I to object? That's right...I'm no one. The people have spoken! The first event, with a over dozen people, was a bit of a logistical nightmare in our little beach bungalow of house, so this event is being scaled down...way down. In fact, we're cutting it in half. We have seven people coming Saturday night at 6 p.m. For those of you not coming to this round, fear not. I'm hoping to make this an almost monthly occurance. Rather than force Long Island wines down everyone's throats, I've proposed a simple theme -- bring one red wine you know you like and one you've never had before. One you like. One you might. We're still in the "Wine Tasting 101" stage with the LENNDEVOURS tasting panel...but at least we've all moved beyond pink wines. Who Knew Chardonnay Could Age So Well? Whew. Last night's vertical tasting of estate selection chardonnay at Wolffer Estate was an absolute blast and highly educational. I've got piles of notes that I need to wade through for a full post (along with some pictures) so stay tuned. Any time that you have the winemaker and the vineyard manager in the same room, it's fascinating to hear both perspectives. I have to say, I was a little surprised when I walked it an the winemaker, Roman Roth, told me we'd be starting with a 1992 vintage. Conventional wisdom says we were in for some not-so-good wines early on...but I can honestly say that not a single one of the wines was over the hill or flat out shot. In fact, the 1992 was the only one that showed any signs of age at all really...and even then it was just on the nose, which had hints of petrol. It's hard to believe, but it's true. My first-ever LENNDEVOURS post was written 365 days ago. 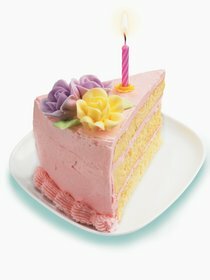 Yes faithful readers, LENNDEVOURS celebrates its first birthday today. What started out as an extension of my semi-defunct blog "Slingin' Ink" has become nothing short of an obsession. Never did I think that this little blog would grow into something this fun and this important to me. I feel priviledged to be a part of the amazing food and wine blogging community. Every day it amazes me that so many talented, creative people share the same love of fine food and delicious wines that consumes me. I'm hooked and I know you are too. So what's up next for LENNDEVOURS? Honestly, I'm never quite sure. Ideas flow in and out of this crazy mind of mine. Some make it here, some don't. I will let you know that in the coming months this blog will be getting a complete facelift, including a brand spankin new logo. How will Lenn celebrate LENNDEVOURS' birthday...besides referring to himself in the third person? I think it's only fitting that I'm heading out to Wolffer Estate for an invitation-only wine dinner that will feature a ten-vintage vertical tasting of their Estate Selection Chardonnays, hosted by winemaker Roman Roth. I've written about Roman and Wolffer often in this blog's first year...so I think it's pretty cool that I'm one of twelve people that were invited to this private event. Anyway, thanks for reading LENNDEVOURS...I know I have a lot of faithful readers and that helps me justify the extensive time I spend writing here! On April 25th, Nena and I have been invited to go into Manhattan after work to attend Windows on Long Island, one of the Long Island wine events each year. The event is being held at Capitale in Manhattan. Tickets are $125 for regular admission and $250 per person for VIP tickets, which include a special preview hour and access to a VIP lounge where vintage wines will be poured. The main event is from 7:30 - 9:30 p.m. with the VIP preview happening at 6 p.m. As a member of the press, I've been invited to arrive at 6:00 p.m.
Any of you other NYC foodies going? 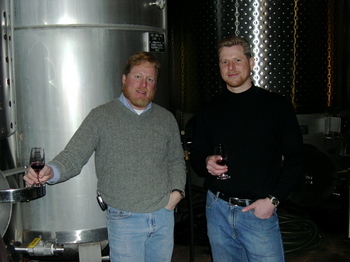 Jamesport Vineyards owner Ron Goerler Jr. and new winemaker Les Howard (right). Eleven years ago, Les Howard had a summer job at Pindar Vineyards on the bottling line, spending most of his time packing cases with just-labeled bottles. A month ago, he was named head winemaker at Jamesport Vineyards. He’s come a long way. Goerler’s father, Ron Goerler Sr., was only the fourth person to plant vines on Long Island, starting the vineyard in 1981. 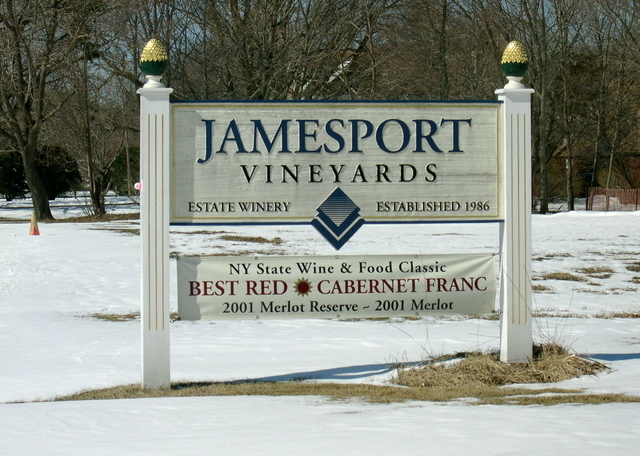 But now with Howard on board, Jamesport Vineyards’ lineage goes back even further – all the way to the 1600s, in fact, when his ancestors were granted large plots on the North Fork by the King of England. And when Howard’s great grandfather passed away and the family sold his potato farm, they sold it to cousins. The North Fork is truly in Howard’s blood. Even so, Howard “never thought of being a winemaker” when he first started at Pindar Vineyards. It was only when Pindar’s winemaker at the time, Mark Friszolowski, told him that he’d make a good winemaker that Howard considered it as a career option. Friszolowski has since moved on to Childress Vineyards in Lexington, North Carolina, but Howard will never forget working with him. Well. Here I am, sitting at my day-job desk, getting ready to leave for the day (a bit early) and head upstate for Nena's bridal shower, which is Saturday. Don't worry, it's not a surprise. Tomorrow, our day is filled with meetings...with the florist, with the caterer, with the tux shop...even one with the pastors performing the ceremony. Saturday, instead of hanging around during the estrogen-filled gift-giving festival...I'm heading to Cooperstown with whatever guys are around and up for it to check out the Baseball Hall of Fame and maybe a Belgian-style brewery up there. I have to admit...even though it's her shower...I'm pretty excited too. After all, a lot of the stuff on our registry was put put there by yours truly...and I'm hoping we pick up some new wine glasses and other fun items. Oh...and there will be some fine wines poured (we're taking about ten bottles up), including the current releases from Pellegrini Vineyards (Cabernet Sauvignon, Cabernet Franc, Chardonnay and Merlot) and some current Bedell Cellars selections, including a soon-to-be-released 2001 Reserver Merlot, their 2003 Viognier and a Gewurtz from their sister winery. Full notes to come next week. When Andrew of Spittoon fame emailed me asking to host an upcoming vintage of Wine Blogging Wednesday, how could I say no? He's one of the most prolific wine bloggers out there and someone I've had some interesting conversations with via email. I knew he'd come up with something clever...and he certainly didn't disappoint. His theme, "Obscure Red Varietals" is one of the more interesting ones we've had to date. I always try to not drink Long Island wines for WBW, and usually it's easy because the themes don't work out for L.I. wine anyway. I thought I'd have to leave this over-grown sand bar for my WBW once again. 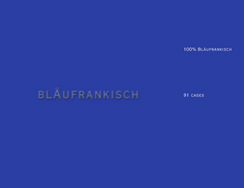 But then I visited Channing Daughters Winery a few weeks ago and got my first sip of their 2003 Blaufrankisch. I was hooked. I get a lot of press releases about upcoming wine events, enough in fact that I could devote an entire blog just to them. I refrain from writing about most of them, but this one caught my attention. Women in Wine, sponsored by the Borgata in Atlantic City and Food & Wine Magazine, offers the opportunity to meet some of the growing number of women running the show in the wine world. Most are coming from California, but Jane Delaney of the Ravensvale Group in Greenwich, CT will also be there. I would have liked to see Theresea Dilworth of Comtesse Therese involved as one of the few, if not the only, woman winemaker in NY...but maybe she's going for fun instead of to work. As a LENNDEVOURS reader, you also have the opportunity to wine a pair of tickets to this even (which is normally $150 per person). If you're interested, enter the sweepstakes. 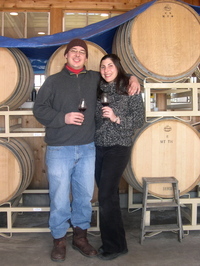 Last week I wrote about Channing Daughters Vineyard's 2003 Fresh Red. This week, I turn my tongue to one of their few white wines that are still available. In other words, the 2004 Scuttlehole Chardonnay hasn't sold out like so many of their small-run creations. 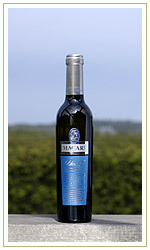 Eyes: This wine, which never sees oak in its creation, is a very pale, lemon yellow. Nose: Nena described this wine as "Grapefruity and grassy. Almost like a Sauvignon Blanc with a little fresh pear at the end." I agree with her but would add faint notes of white peaches and some mineral quality as well. I didn't get as much grass as she did either. Tongue: Fresh, light and crisp...this wine offers delightful citrusy flavors with hints of green apple and pear on the finish. Reminds me a bit of some Chablis I've tasted. It has more body than a Sauvignon Blanc, but not heavy at all because of its food-friendly acidity. Food: Nena picked this one out to serve with some parmesan-crusted chicken thighs I made and it paired marvelously. 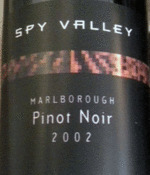 This is an absolutely great wine for foods like fish, shellfish, light chicken and young cheese. Overall: Delicious. We both love this wine and it will be one of the wines we offer at our wedding reception. It doesn't get much better than this in a refreshing, unoaked Chardonnay. It would make an excellent house white to buy by the case for parties too. I hope California Chardonnay makers are paying attention. By the way, Scuttlehole is the road their winery/tasting room is on...and most of the grapes for this wine come from the vineyard just outside their window. Wine Blogging Wednesday is this Wednesday, March 9, hosted by Andrew of Spitoon. I know a lot of you are very excited and interested for this one, but in case you forgot, the theme is Obscure Red Grape Varieties. Remember, the key is obscure, but if you're not sure what qualifies, check out Andrew's post and the discussion after. This should be one of the more interesting editions of WBW...and, as always, the more the merrier! Italian wines are challenging to really get to know. Different regions have different label conventions...and sometimes I find it difficult to decipher them at all. This wine (picture is on it's way), isn't like that. No doubt to attract New World drinkers, Sfida 2003 Rosso offers a simple label that tells you right away what is in the bottle...a blend of Primitivo (60%), Sangiovese (20%), and Cabernet Sauvignon (20%). I like trying interesting red blends, and at this price ($9 at Stew Leonard's), I just couldn't say no.